In fiscal 2017, TUMSAT launched the School of Marine Resources and Environment and reorganized all of the other schools. Through these reforms, TUMSAT reinforced its structure as Japan's only university dedicated to marine science and technology. Taking advantage of these reforms, we need to raise TUMSAT's profile in broader society. To this end, we have decided to launch the TUMSAT Fellowship Association to contribute to the development of the university by: vitalizing new interaction among various stakeholders throughout the university, including university and graduate students, alumni, students' supporters, faculty members, and alumni associations; promoting closer relationships between the university and the fellows and strengthening their collaboration. 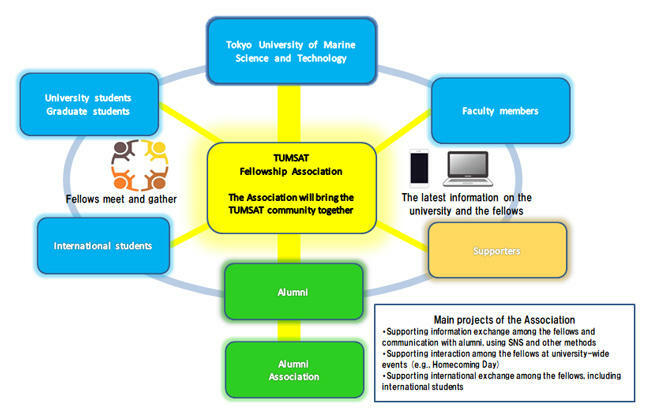 What is the TUMSAT Fellowship Association? The TUMSAT Fellowship Association strives to help the university accomplish its philosophy and mission and contribute to its international development, as well as promote friendship and information exchange among its members. The Association will also conduct the following projects, aiming to contribute to social development. In the TUMSAT Fellowship Association, new students, existing students and faculty members are registered as fellows. An e-mail will be sent to all fellows in April or later with information on how to log in. If you are a graduate of TUMSAT or its predecessor, a supporter of a student, a faculty member (including retired), or a group established at the university (e.g., alumni association, sport group, cultural group, class, or a seminar group), you are also welcome to register as a fellow through the following Fellowship Association System.